Today we shall be looking at a few good lavalier solution/mic for wireless video recording. The word lavalier refers to a type of jewelry that is worn around the neck. That means a lavalier microphone is one that is worn around the neck or some such suitable place on the body of the subject being recorded. Such microphones are extremely convenient to work with. They are non-intrusive. Meaning, they rarely interfere with the flexibility and mobility of the user. Additionally, being small in size these lavalier solutions stay out of the line of view of the camera and therefore adds to the production value. They are positioned near the neck of the user, usually attached to a piece of cloth worn by the user. Therefore the clarity of sound is always exceptional. Plus, as these are lightweight sound accessories, the user never feels inconvenienced wearing them while acting or working on the stage. There are many different varieties of lavalier solutions for video recording. Both wired and wireless. 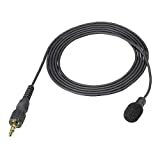 In this blog article, we will look at the wireless lavalier mic options. The Senal CL6 Miniature is a lavalier solution. It works with specific bodypack transmitters. These include the Sennheiser EW, Lectrosonics, Sony UWP, Audio-Technica and Shure transmitters. The mic head is a very small, only 4mm in diameter. The design is omnidirectional and produces low handling noise. Omnidirectional ensures there is no change in audio volume even when the subject moves his / her head while speaking. Additionally, windscreens are provided that suppresses wind noise when recording. The Senal CL6 has a frequency response rate of 20 Hz to 20 kHz. Additionally, some mounting clips ensure easy mounting on a piece of clothing. The mic comes with a built-in 48V power supply. 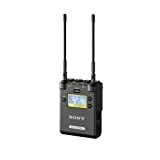 Another excellent lavalier solution is the Sony ECM-V1BMP is designed for the UWP transmitter bodypacks. 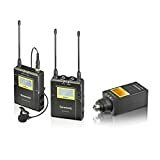 The UWP is a wireless bodypack type transmitter, and these lavalier mics complete those systems. This lavalier microphone is designed for the Lectrosonics wireless transmitter. This mic features an omnidirectional polar pattern. Thanks to this technology the recorded sound quality is great irrespective of the direction the speaker turns his head while speaking. A TA5 universal locking mechanism has been provided which ensures that the mic connects with compatible Lectrosonics transmitters. Additionally, the Sanken COS 11D comes with an emission protection system. This system ensures that the mic is protected from signal emissions that happen due to new forms of digital transmitters. Additionally, the design is water-resistant. This is ideal for those outdoor / location shoots and in inclement weather. It is, therefore, one of the best lavalier solutions for wireless video recording. This is a microphone design for the Sennheiser wireless transmitter series. The Countryman B3 is an omnidirectional lavalier microphone designed for some digital transmitter systems. The one in discussion is designed for the Sennheiser Wireless Transmitter (bodypack) Evolution Series. 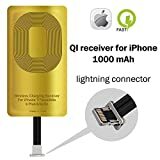 It has a 3.5mm connector that connects to most devices though the mic is optimized for digital transmitters. The mic captures excellent audio quality with very good suppression of noise and interference from the digital transmitter. The overall design is very minimalistic. A major USP is that the mic is highly moisture resistant. Thus it should be usable in inclement weather conditions as well as hot and sultry conditions because it remains unaffected by perspiration. Another plus point of the B3 is that it comes in an array of colors including skin color. Many times when shooting interviews or other situations the wide angle of the camera makes it impossible to hide the mic. In such situations a skin colored mic gives the option to tape it to the subject’s skin, let say to the side that is away from the camera, thus completely obscuring it from the camera’s view. 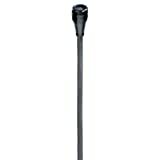 The Azden EX-503 is an omnidirectional lavalier microphone. In other words, the mic remains unaffected by the subject moving his head in any direction while speaking. The mic will still pick up the sound and record it in great quality. It is compatible with Azden VHF body pack transmitters. The overall design is very lightweight, but the quality is good. 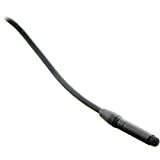 A 3.5mm mini-jack connector ensures that the mic connects with a wireless transmitter. The Sanken COS 11 DBP is optimized for digital transmission. Being omnidirectional means there is going to be little or no effect when the individual wearing this mic turns his/her head while speaking. This is a water-resistant design and therefore ideal for shooting videos outdoors. A set of AA batteries powers the mic. It comes with a shielded RF noise protection system that ensures that the mic can suppress noise better than traditional systems. It also has a wide frequency response. 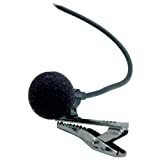 The Sony ECM 44BMP is an omnidirectional lavalier microphone that comes with a 1/8” locking mini-plug. This mic is compatible with the UWP and WRT-805 series wireless transmitters. The ECM 44BMP is an electret condenser microphone with tiny dimensions. Excellent sound quality and by its tiny dimensions is completely obscured from the camera. The mic comes with a nice black finish. A 1/8” locking mini plug ensures that the mic locks in perfectly with the compatible wireless transmitters. The Shure WL93 is an omnidirectional lavalier solution. It is designed for wireless transmitter systems and is compatible with Shure wireless transmitter bodypacks. The omnidirectional design ensures that the mic can pick up sound from all angles. This is handy when the subject is speaking and turning his head. The design is small and is aimed to provide a discreet solution for stage, film and other purposes where the wearer doesn’t necessarily want to show off that s/he is wearing a mic. To assist in the process of mounting the mic on to the clothing of the speaker, the WL93 comes with a mounting block with a tie bar attached and a bracket that is sew-on. Plus, to assist in shooting clean audio quality even in outdoor, and especially windy situations, the WL93 comes with an acoustic windscreen. This minimizes the windy noise. A 4-pin mini connector connects the mic with the Shure wireless bodypack transmitter. The Audio-Technica AT899CW is another omnidirectional lavalier solution. But this one is optimized for the Audio-Technica UniPak transmitters (bodypack) only. This is a subminiature condenser omnidirectional lavalier and promises to produce fantastic audio quality regardless of the direction of the speaker’s head. The overall size of the AT899CW is demure. At just 5mm it is small enough so that the wearer can tuck it under a lapel or collar. Most likely, it will not be seen in the final shot. Additionally, the large frequency response segment makes this is the ideal mic for most types of uses. There is a switchable low-frequency roll-off. When used the AT899CW becomes more resistant to annoying noise. 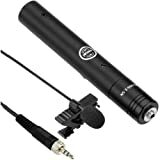 The mic comes with a 1.4 meter (55”) cable that ends with a 4-pin locking mechanism that slots into an Audio-Technica UniPak transmitter bodypack. This is yet another excellent lavalier solution. Designed for the UniPak transmitter (bodypack systems) the Audio-Technica AT829cW Cardioid condenser lavalier mic is great looking and excellent performing lavalier mic. Being a cardioid lavalier microphone, it has the similar low-frequency boost for close sound sources as traditional hand-held mics. But the problem, on the other hand, is that cardioid mics don’t have the same capability as omnidirectional lavaliers in picking up sound from all angles. As a fact, the mic has a 120 ˚ of acceptance only. That is a minor problem though, as you get an A-Clip to position the mic securely facing front. On the bright side, most off-axis sound signals are rejected by the mic. There is a locking pin connector, at the end of the 55″ cable, which ends with a 4-pin connector that connects with the UniPak transmitter. Let’s take a quick look at a couple of wireless transmitter/body-pack systems covering the lavalier solutions we read about above. These are necessary to complete your set-up of a wireless audio recording system to go with your video recording equipment. The microphone's cardioid polar pattern provides a 120° angle of acceptance. The microphone comes equipped with a clothing clip and a windscreen. The Shure UR5 Portable Wireless Microphone is a portable receiver and microphone system. This is a complete lavalier solution and is ready to use straight out of the box. It can record great quality audio on the go. 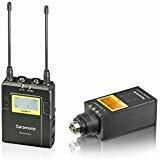 Many times you need a wireless recording solution for those tricky situations where the individual is several meters away from the camera or when the built-in mic of your camera isn’t dependable. Let’s say you are shooting a scene where two people are talking to each other and walking either towards the camera or away from it. Now, a traditional off-camera sound recording wouldn’t work efficiently in these scenarios. The solution is to use a wireless system like the Shure UR5. The system comes with the WL 183 omnidirectional lavalier mic, the UR5 portable diversity receiver, and the UR1 Bodypack transmitter. The antenna hides neatly behind the subject, tucked either onto the waist belt or a waist pouch. There are some salient features of this system that makes it a fantastic solution for your video work. The portable UR5 is capable of 2400 selectable UHF frequencies. Plus, you can monitor the sound levels using a headphone monitoring output. You can also monitor the mic and aux-level balanced output and tone generator and do a lot more. The transmitter has a reach of up to 150 meters (depending on the line of sight) to transmit audio. 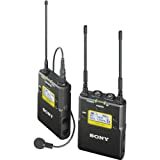 This complete wireless sound recorder system consists of 2 EK 100 G3 Bodypack Receivers, 2 SK 100 G3 Bodypack Transmitters, 2 ME 2 Clip-on Lavalier Mics and a handheld omnidirectional ENG microphone. The UHF wireless microsystem consists of 1680 tunable frequencies. Additionally, the microphone has 21 frequency banks, and a total of 12 frequency presets per bank. This system works on UHF frequencies which have longer ranges compared to cheaper VHF frequencies which can be a little dicey. The SK 100 G3 plug-on transmitter connects wirelessly to any standard microphone that has a 3-pin XLR connection. The transmitter draws power from a set of two AA batteries. Optionally you can power it using a compatible accupack.